I'm a big YA fan. I am also a huge fan of the Hunger Games Trilogy. The books and the movies. Ok.... mostly the books. The books AND the movies. Not JUST the movies. My belief is that you MUST read the books... and then the movies are a magical add on. If you haven't read the books... but you've seen the movies... I think you've totally missed out. Anyway...I love the books and movies. If there is something I can rave about in the movies... it's the costumes and set designs. They were pretty much perfection. The movies were gorgeous... and the colors (both over the top colorful and dismal grays and blue hues) really set the mood perfectly. The way the books' descriptions made me feel were totally conveyed through the colors. The movies were visually spot of for me. Discovery Times Square is located at 226 West 44th Street between 7th and 8th Avenues, directly across from Shubert Alley. The special little features of the Exhibition were really cool. We picked up a digital tour guide and headphones at the entrance. As someone who read the books and saw the movies I found all of the little details really interesting. The little bits of trivia... like the movies Mocking Jay pin was actually designed from the Scholastic hardcover image from the book... and that part of Suzanne Collins' inspiration for The Hunger Games trilogy came to her while flipping TV channels between a reality show and coverage of the Iraq War... and how crazy Effie's shoes actually are! Following the tour through the exhibit gave us a little taste of really being in Panem... and follow Katnis through her journey. 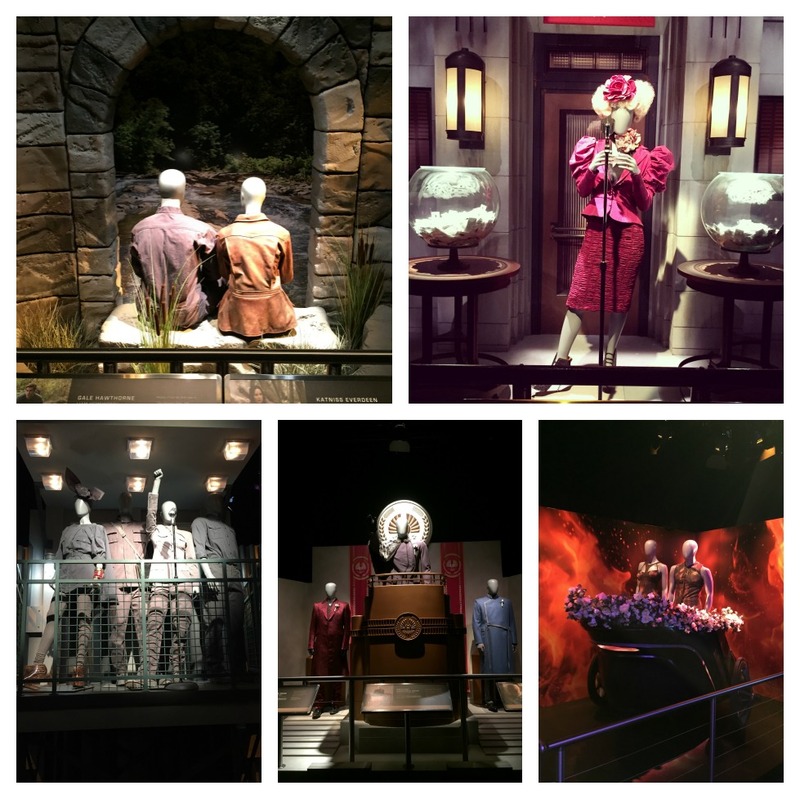 The exhibit areas include District 12, The Tribute Train, The Capitol, Making The Games, District 13, Katniss's Journey, and the Fan Gallery. Each area of the exhibit had some interactive features. Larisa and I were able to learn some skills to use in the games, try out the Game-makers' interactive map, participate in polls by voting with marbles (and then see what the ongoing tally is), sit down for an interview with (hologram) Caesar Flickerman, and even make our own propaganda spot to support the revolution. Let me tell you... I would not have won any of the Hunger Games. Larisa might have had a shot though! Seeing all of the actual movie props throughout the exhibition was pretty cool. I was able to look back and remember seeing exactly where I had seen the items in the movies. As a fan it's just neat to know these items were up on the big screen being used for the storytelling. The set recreations throughout our tour were amazing. Again... each set made me replay the actual scene in my head. It was a little surreal to actually SEE the movie in person. But my favorite part of the exhibition had to be the costumes scattered throughout the tour. They are absolutely amazing. I have to say I would love to own most of Katniss's "regular life" wardrobe. Her jackets and boots are amazing. And I need to find someone that can make me her sweater wrap shawl. Seeing the wedding gown and mocking jay gown was pretty unreal. The details that are involved in each piece of wardrobe left me a little awe struck. If we had more time I could have stood and stared at each piece for much longer. And best of all? I got to have some one on one time with my niece. It doesn't happen too often, so it made it special for me. I'm hoping she'll get on reading the books so we can have some Aunt/Niece movie viewing time soon! The Hunger Games Exhibition is going to continue being shown at Discovery Times Square until January 3rd. After that it will be moving to San Francisco. So... if you're looking for something to do over the Winter Break... and you love The Hunger Games... I would highly suggest scheduling a visit while it's still here. You can even buy your tickets online.